I'm a sucker for wind chimes. It's true. A long time ago we lived in an apartment building and the lady in the balcony right above ours had wind chimes All of them. The tinkling kind, the deep echoing kind, the gonging kind, you name it, she had it. All the live-long day and night, they chimed. Rain, sleet, snow, hurricane, they chimed. Happy days, sad days, angry days, you guessed it, they chimed. Even on the stillest of days, when you'd not think a breath of breeze was blowing, those little chimes sang. It didn't take a stiff breeze to set them off. Maybe a cat passed by brushed them with it's tail. Maybe someone stomped or slammed a door. They were sensitive. As life went along and we left that apartment for greener and hopefully quieter pastures, I found that I missed those chimes. No one was more surprised than I was when I decided I needed some of my own. I like the deep echoing kind the best. And now, well, I'm a sucker for wind chimes. It's true. Know why? Because God is like that. He catches the wind no matter the season or weather. He is sensitive to the slightest vibration or change in the air. And no matter the mood or whether it seems particularly appropriate, He plays back a song of love. In the brightest sun, or the dead of night, regardless of whether or not we want to hear it, He chimes a song of love into our hearts. Maybe, like me, you need an actual wind chime to remind you. Can you hear it? This is beautiful, Shelly! I love wind chimes, too. Right now I have only one, but it hangs in the tree outside my window, tinkling in the breeze. 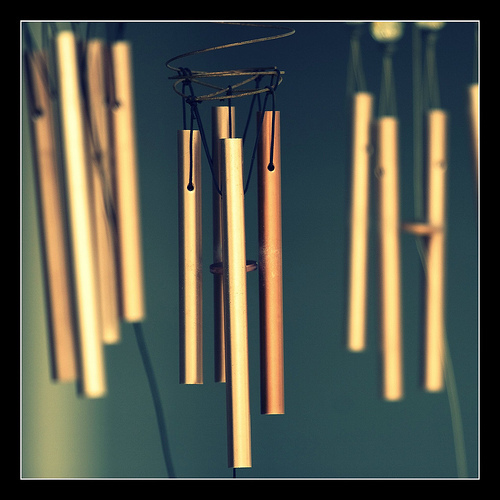 I love the image of God being like the wind chime - noticing the slightest stirring. He is all around us, listening, watching, loving. I am so thankful! I love how God will show you a truth about Himself through just simple everyday things. What a might God we serve! Beautiful thoughts, loving the analogy - thanks for sharing and for linking up with 52 Weeks series! Be blessed!